Dr. Drexel Rayford once told about his experiences baptizing young people at his first church, the Muldraugh Baptist Church in Muldraugh, Kentucky. Their church baptistery, says Dr. Rayford, was fed by weak plumbing and normally took over 36 hours to fill. However, due to some quirk of the plumbing, sometimes the water would suddenly start gushing out rather than trickling as it normally did, and if you weren’t regularly checking back on the level of the water, it could overflow into the choir loft. Unfortunately they couldn’t trust their custodian, Homer, to make certain things worked right. Homer often slipped off and spent his hours at the local tavern. 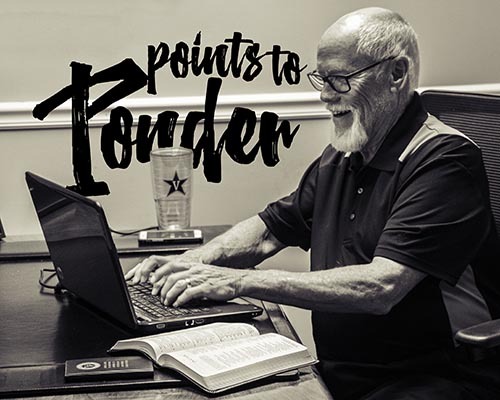 One time Rayford told Homer to fill the baptistery on Thursday before a Sunday service in which they were planning to baptize nine young persons, eight girls and one 13-year-old boy. Rayford then went out of town and came back on Saturday night. He didn’t think to check the baptistery. Sunday morning came and Rayford discovered that the baptistery was bone dry. Nine kids were getting baptized in just three hours. This was a big day for their families. There was no way to cancel the baptisms for lack of water. So Rayford literally ran to the parsonage next door, grabbed a garden hose, ran it across the driveway, up the front steps, down the center aisle and into the baptistery. In one hour, the baptistery was full of water, right out of a Kentucky limestone well. And it was cold, really cold, Rayford reports. It must have been all of 50 degrees, which might as well have been freezing for the young people who were being baptized. In preparation, I want you to do some research on baptism. See how many scriptures you can find which use the word baptism; use bible concordances, the internet, or have conversations with others about their baptisms. Then come prepared to hear the Word of the Lord and experience God’s presence! Thanks for writing such an extrsso-undey-tand article on this topic.